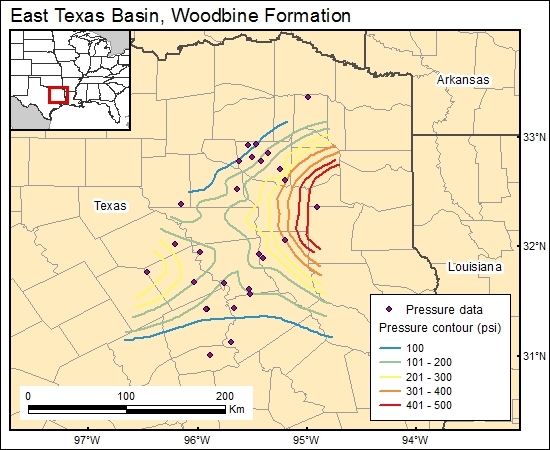 The Woodbine Formation was originally at hydrostatic pressure, but it has been extensively depressurized by production (Kreitler and others, 1984, their fig. 44). Kreitler, C. W., Collins. E. W., Fogg, G. E., Jackson, M. P. A., and Seni, S. J., 1984, Hydrogeological characterization of the saline aquifers, East Texas Basin-implications to nuclear waste storage in East Texas salt domes: The University of Texas at Austin, Bureau of Economic Geology, contract report prepared for U.S. Department of Energy, under contract no. DE-AC97-80ET46617, 156 p.